I am really excited to bring you guys this cool hair style how-to video. 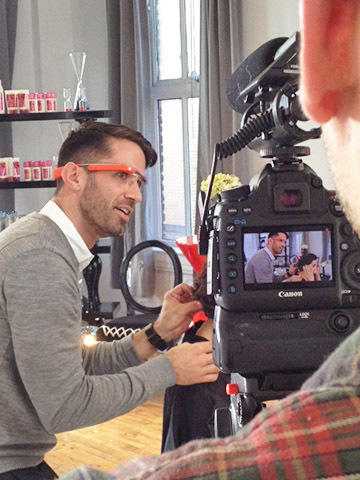 Matrix has partnered with Google Glass to bring us a new era in hair tutorials. These "Matrix Class for Glass" video series will consist of hair 'how to' videos and will set the standard in beauty and trend innovation by featuring the wearable Google Glass device as a way for consumers to view how to recreate a trendy look through the stylist’s eye. This passed Friday, the brand debuted their premiere video that features Kika Rocha with Matrix Artistic Director, Ammon Carver. In the video, Kika works with Ammon to prepare for an upcoming red carpet appearance. Kika Rocha served as the Fashion and Beauty Director at People En Español and has been seen on the red carpet as a TV fashion critic on top Hispanic networks like Univision, CNN Espanol, and Telemundo. I truly love this because it shows us a whole other level of hair tutorials or beauty tutorials as a whole for that matter. This is the first of its kind and the biggest partnership the brand has ever been involved in and no other beauty brand has stepped into this yet. I assure you this Google Glass technology is going to take over, I am positive many more brands and vloggers will be publishing and loving this new era of how-to videos. What are your thoughts on this new era of tutorials? I love them! I was not compensated for this post. All opinions, as always, are my own.